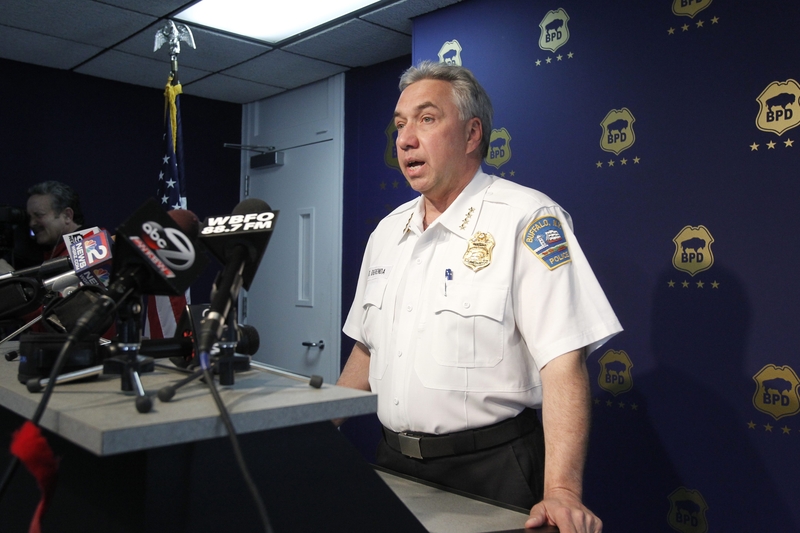 Buffalo Police Commissioner Daniel Derenda speaks to the media about the investigation of a suspect who was abused while in police custody during a news conference earlier today. Police Commissioner Daniel Derenda this afternoon announced that six police officers have been placed on administrative leave pending the outcome of the investigation into an April 19 incident captured in a YouTube video that showed one of the officers slapping and kicking a man after he had been subdued and was lying on the ground in handcuffs. Earlier this morning Derenda held a news conference, where he condemned the officers’ actions. “The Buffalo Police Department does not condone or tolerate inappropriate behavior,” Derenda said, adding that he has spoken with U.S. Attorney William J. Hochul Jr. and Erie County District Attorney Frank A. Sedita III about the incident. He would not say whether a federal investigation has been opened into the alleged police brutality. After receiving a copy of the video emailed to Derenda and Mayor Byron W. Brown late Friday, the commissioner said he immediately instructed his Internal Affairs Division to start an investigation, which continued through the weekend and is nearing completion. Brown told The News today that he watched the video. The man who allegedly was assaulted has been identified as John Willet, 22, of Williamsville. He has been charged with criminal possession of a controlled substance, suspected heroin and crack cocaine; unlawful possession of marijuana; resisting arrest and obstructing governmental administration. The alleged police attack occurred at about 10:30 p.m. April 19 at the intersection of Philadelphia and Ontario streets in Riverside after a police pursuit of a vehicle. “There was a vehicle-and-traffic stop and he was arrested,” Derenda said, declining to give additional details on the charges placed against the man. The commissioner said officers are required to report acts of police brutality if they witness them. At the beginning of the video, apparently recorded by two eyewitnesses, the man is seen struggling on the ground as a lone officer attempts to handcuff him. Then at least three other officers arrive. Throughout the incident, the man screams for help and, at points, asks police to stop hitting him.